US Immigration Visa Services in India - Apply Online: H1B Visa, L1, B-1, Green Card, and More. VisaPro India is the local arm of VisaPro Law Firm in the US. 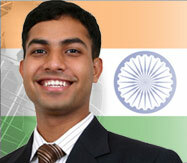 VisaPro gives residents of India access to a full line of global immigration services. The entire process is performed online making your visa application Fast, Easy and Economical. Receive latest immigration updates and free legal tips by e-mail. View Latest Newsletter. Follow Us: Copyright © VisaPro.com - All rights reserved.